This library of videos and photos demonstrate how parents with disabilities use adaptive parenting techniques to assist with child-rearing. We hope these videos and photos will assist parents and prospective parents with disabilities navigate parenting. Interested in submitting a video or photo? 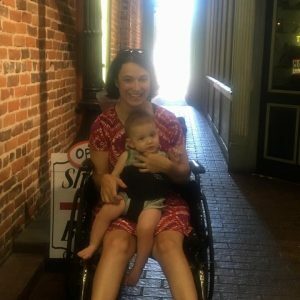 The Disabled Parenting Project wants your videos and photos demonstrating how parents use adaptive techniques for child-rearing. To ensure accessibility, please include a description with all photos. In addition, videos must include audio description (please verbally explain exactly what you are doing). To submit videos and photos, please email us. 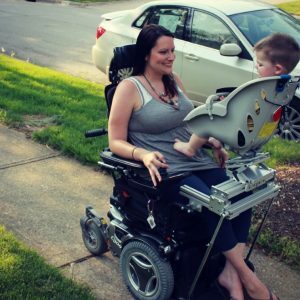 Mother who has cerebral palsy demonstrates a parenting hack she uses to hold her son. This carrier is supposed to be strapped to a chair and used like a high chair. Instead, she strapped it to herself to carry her son around in her wheelchair. Mother in power wheelchair uses a specialized seat that attaches to her wheelchair. Son is able to sit facing her. Seat is from a bicycle. Woman in power wheelchair holding baby in sling carrier. 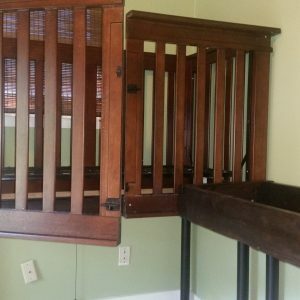 Accessible crib and changing table that parent can roll under in her wheelchair. She cut the front face and added locks, so she can access it from the front.